Hi there! 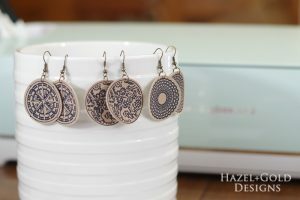 My name is Wendy and I blog over at At Lane and High. I am crazy for anything to do with the home, whether its decorating, DIY or just things that make life easier. We are all so busy that our homes need to be our sanctuary and I believe it can be without spending a fortune. 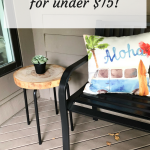 I am so excited to guest post here and I hope you like what I have to share for you today. 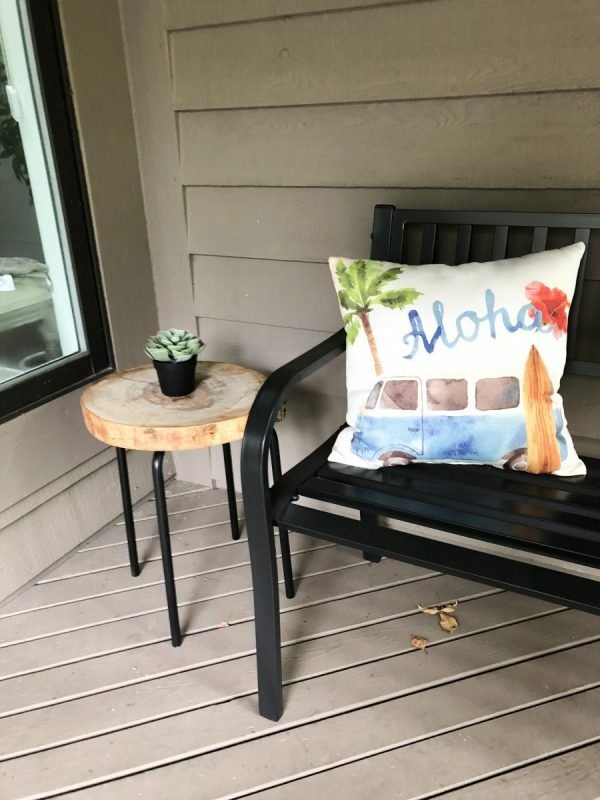 I have been working on my front porch this summer and I have a nice porch but I live in Ohio so about half the year it’s pretty bare. Because of the elements…you know…snow. YUCK! 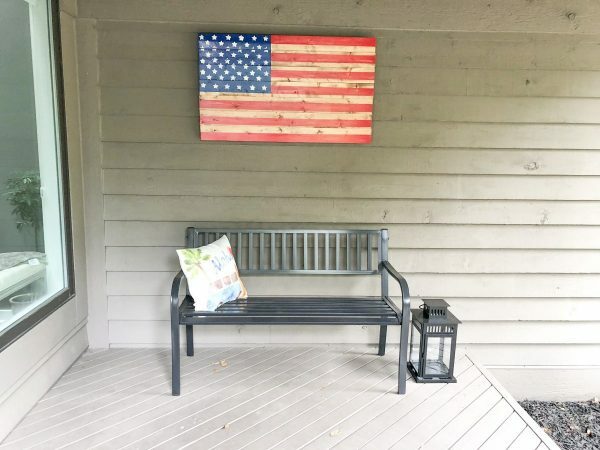 I recently bought this cute bench from Wayfair and made this awesome wooden American flag. I love that flag so much! 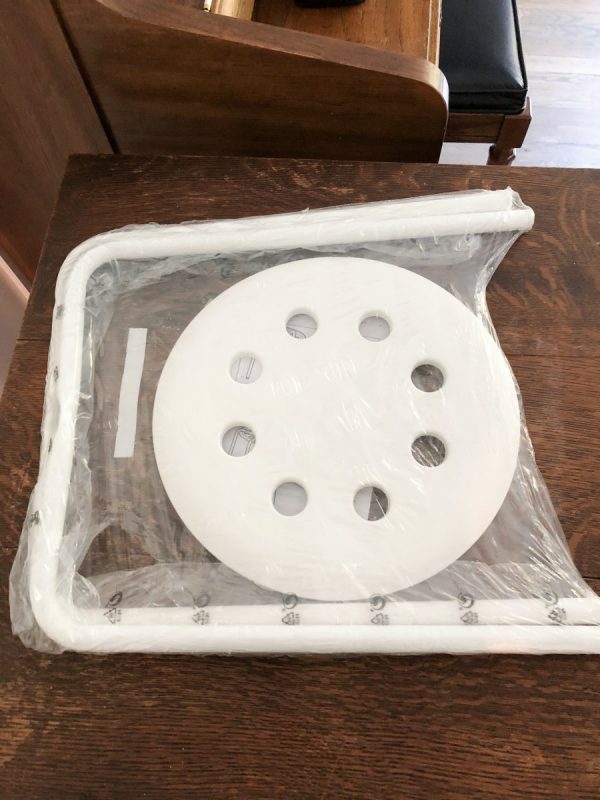 So filling in with the decor I knew I needed a small end table but I didn’t want to spend a fortune. So I decided to make one. 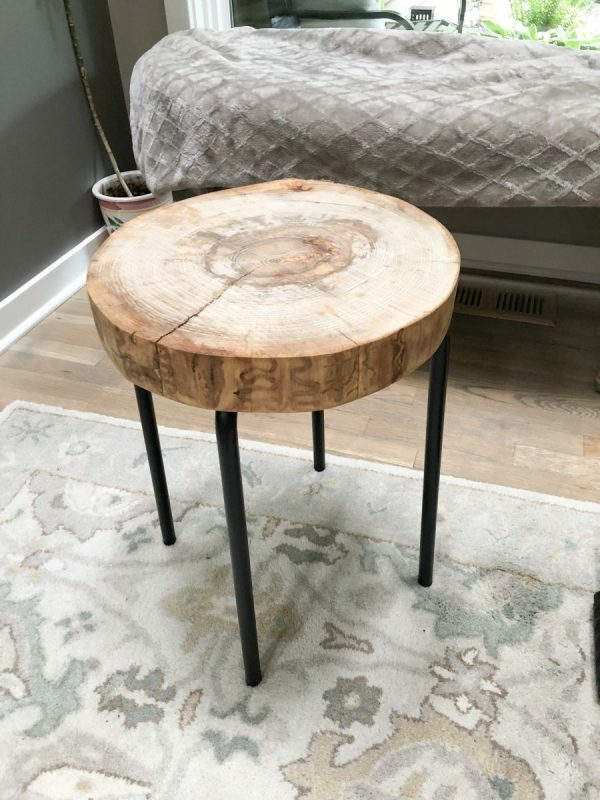 For this side table, I didn’t want to spend that much because I still have so much more to add so I took this 2-inch tree slice and bought a $5 bench at Ikea and voila! Instant side table. So the story as to why I have this tree slice is a neighbor had to cut down 5 Ash trees. Here in Ohio the Emerald Ash Borer has invaded the trees and is killing them. It’s really sad, they are everywhere here. So I asked him if I could have a few of the pieces he had laying around. I took 4 of them that were about 4 feet long. I took two to a sawmill and had them sliced into cookies, that’s what a tree slice is technically called, a tree cookie. Did you know that? I didn’t until I did all this! 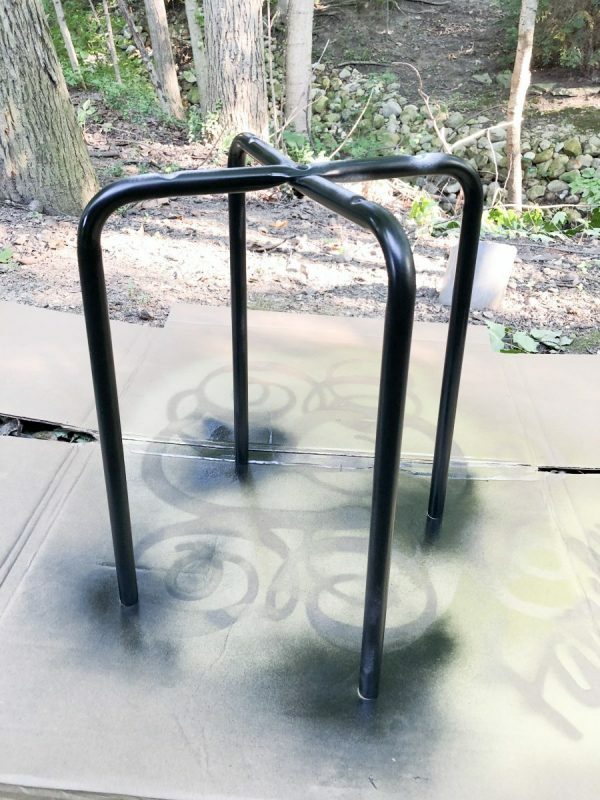 So it was $7 a slice for the cookie, the stool from Ikea was $5 and I decided it needed to be black instead of white so I bought a can of spray paint for $3. All in I am at $15! Pretty sweet eh?! Okay so here is what I did, you will be shocked at how easy this is! Sand and polyurethane the tree cookie. 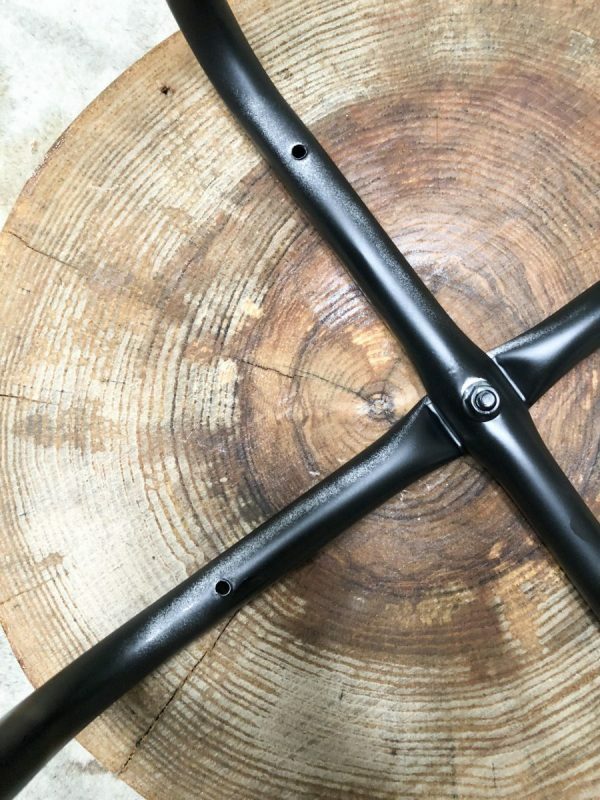 I assembled the stool legs by putting the single screw in the center to hold the two legs together. 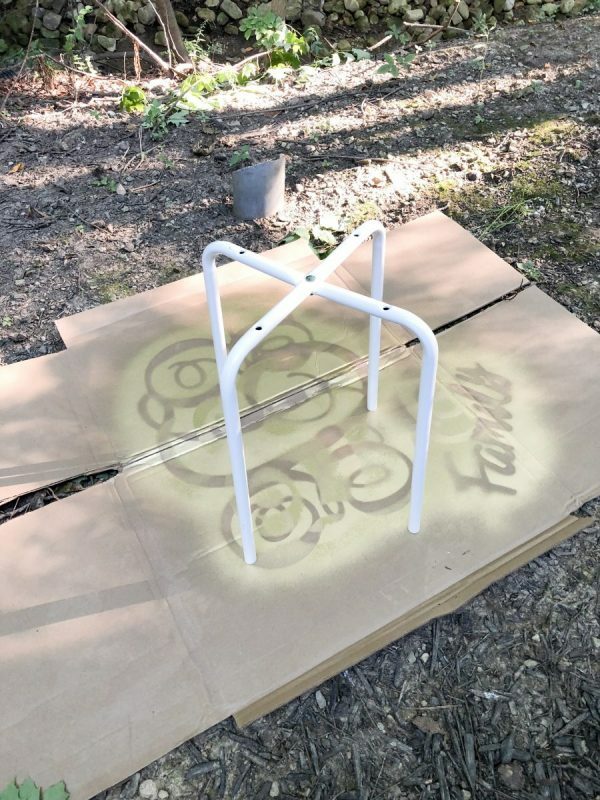 Next, I took it outside and spray painted. Make sure you shake the can well and make long sweeping strokes. Don’t hover over one area long because you will get drips. I did two coats of paint on here. I did this all one evening after work in my backyard. Then before I went to bed I brought them in and let them dry fully overnight. It’s now time to assemble. I put the tree cookie upside down and screwed the legs into what will be the underside of the table. 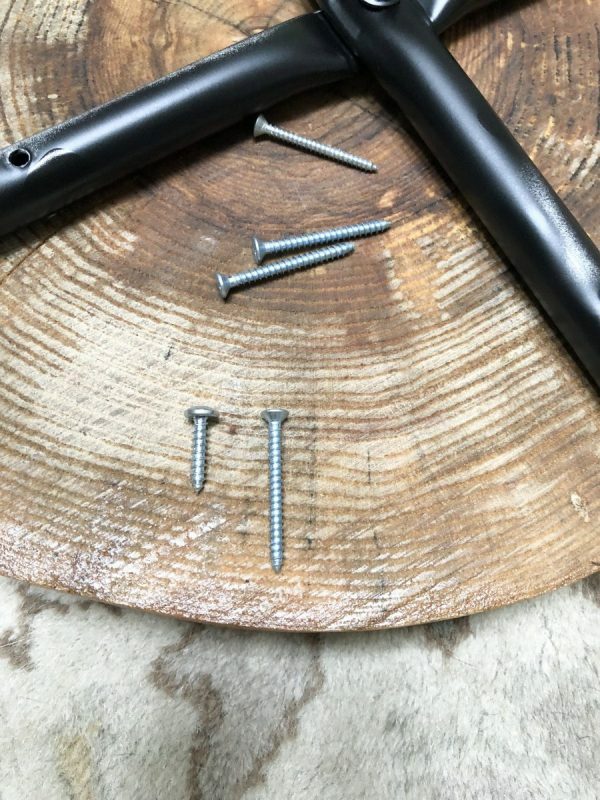 The screws that it came with were too short so I have this coffee can of old screws and found some that were the right length. 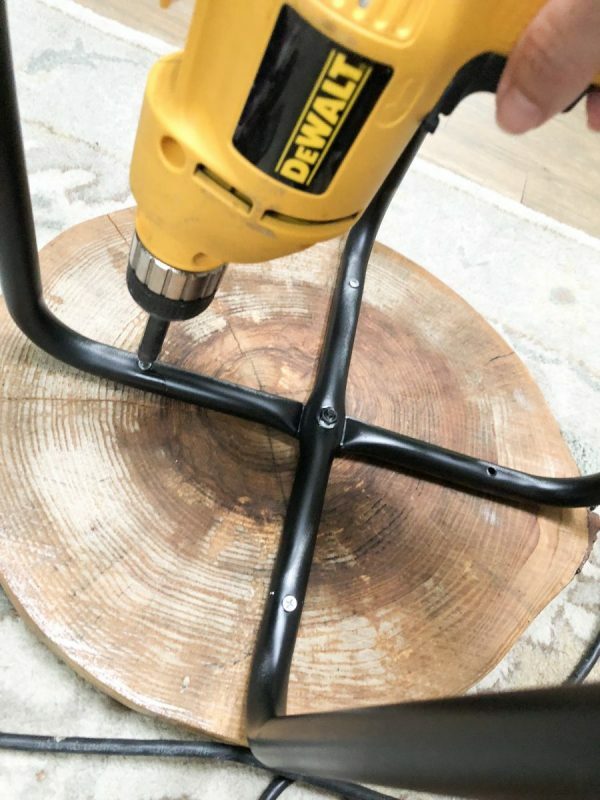 Using my electric drill I screwed the legs in. That’s it! 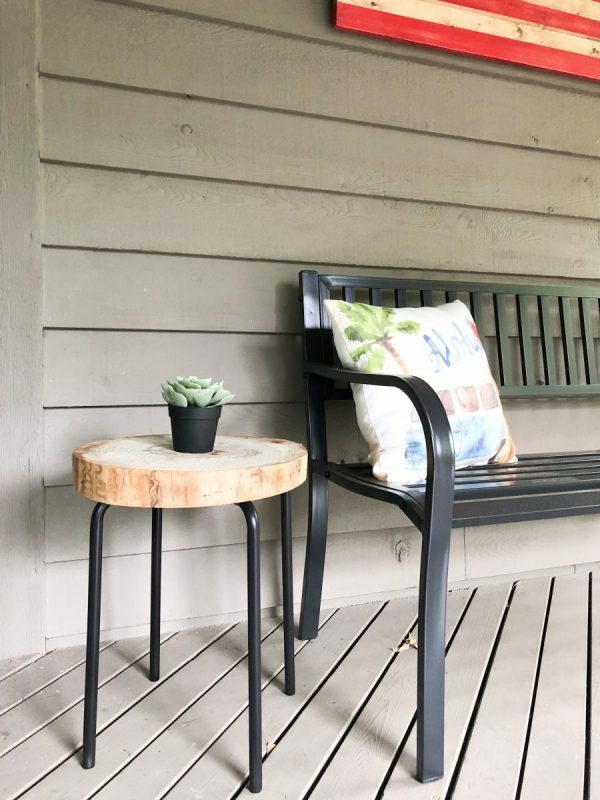 I put my new DIY Side Table out by the bench and I just love it! I have this cute faux succulent from Ikea that looks perfect on top. Fall is just around the corner and I can’t wait to put pumpkins all over! Check out the before and after. It balances the porch out perfectly! 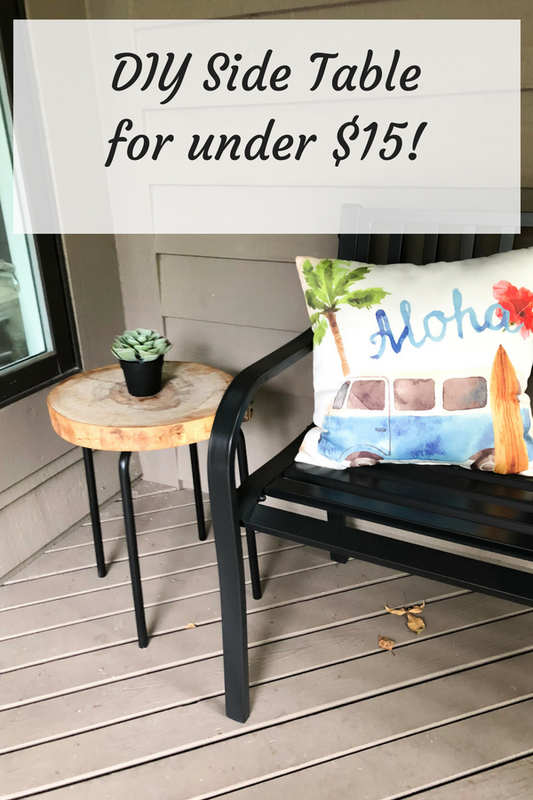 And for only $15, you cannot go wrong! 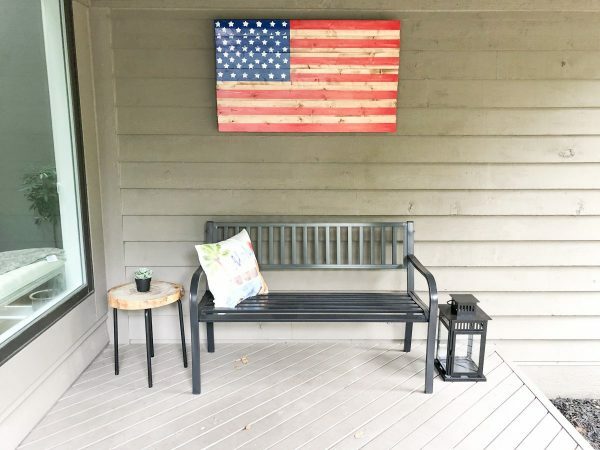 If you would like to get the tutorial on how to make the Wooden American Flag you can click HERE. 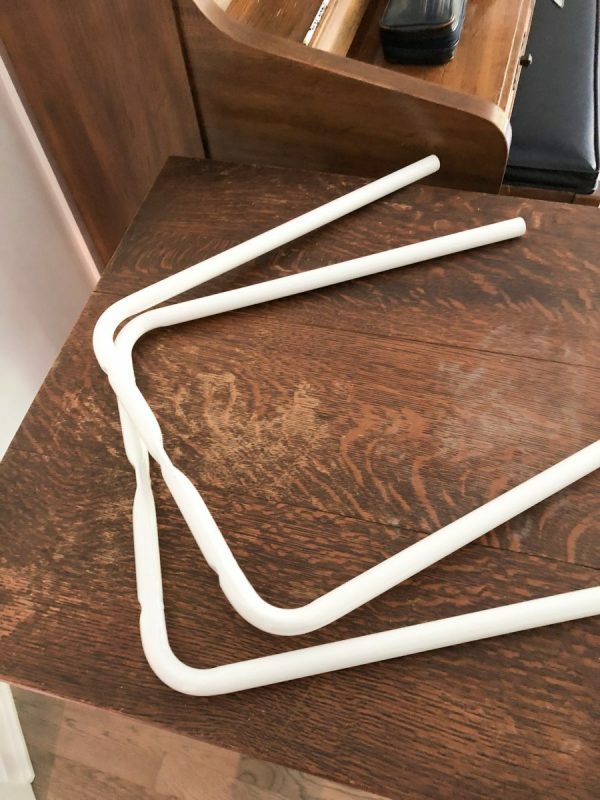 It’s another easy project that can be done in a weekend! Thanks so much for having me! 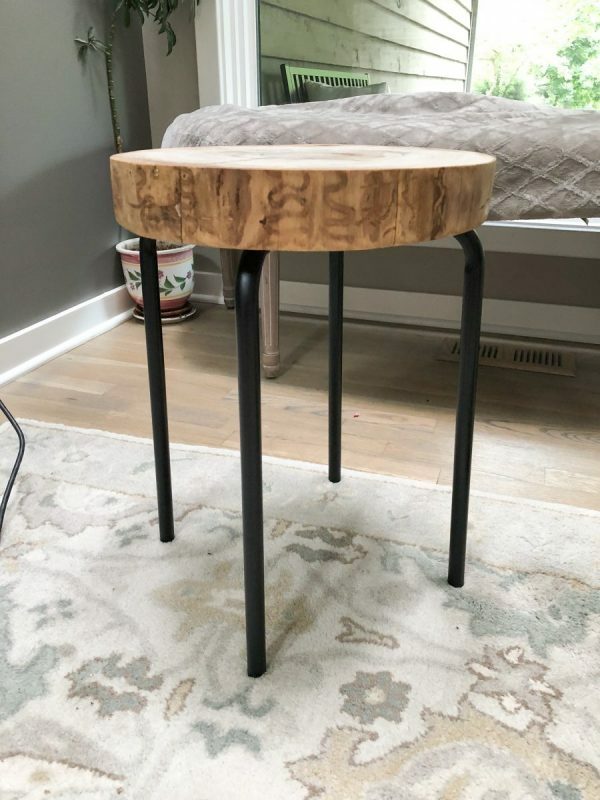 I loved sharing my DIY Side Table with you. 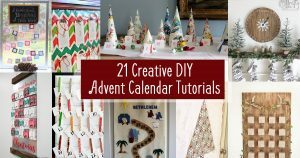 If you like this project, please share on Pinterest! And feel free to comment or ask questions. Thanks again! My name is Wendy, I live in Ohio with my husband, two teenage daughters and adorable dog Lilly! My goal is to make my home the most functional and beautiful place it can be to make my life easier and more enjoyable. I hope you can get some inspiration to do the same with yours. Thanks for stopping by! I love the wooden top! It fits there so perfectly!! Thanks for sharing with SYC. I’ve read about the ash borers, such a shame, but you found a great way for one of those trees to ‘live-on’! Thank you for sharing at Party In Your PJs! You have to have somewhere to pop your cuppa if you sit out there of an evening! This looks great. I had no idea they are called cookies, you learn something new everyday!